crocheting – Page 3 – It's a T-Sweets day! I love being able to check off Christmas list presents. Don’t you? I am especially happy to check off another beautiful Grinda Shawl. I used a Scheepjes Whirl yarn in the most beautiful shades of cream and blue. It is always easier to crochet or sew something the second time around. The language is clearer and the stitches are familiar. When my dear husband asked me to make his mother a shawl along with the shawl for my mother, I knew that it would be no problem at all. In fact, I welcomed the opportunity to see this shawl made up in a different color scheme. I absolutely LOVE the the subtle gradients from cream to royal blue. It looks so beachy. Aren’t they so pretty? They can only be prettier by adding the dear SWEET faces of the two mothers I love the most in the whole world!❤️❤️. It is going to be a very Merry Christmas this year! Update— Here are my two beautiful mothers in their two beautiful shawls!! 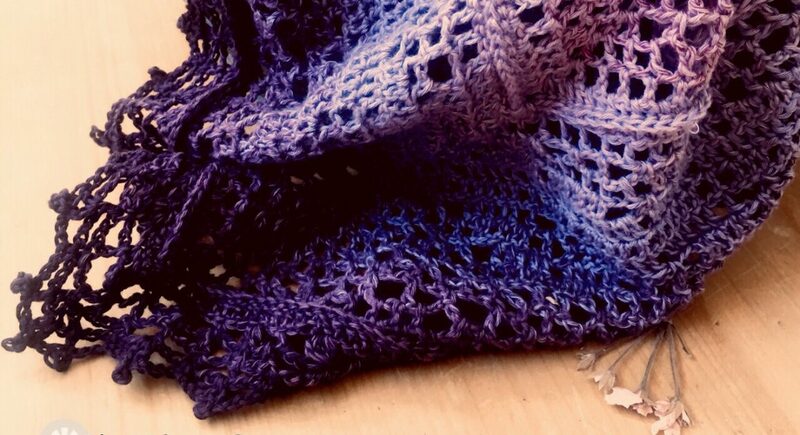 The Grinda Shawl is a free pattern from Lilla Bjorn Crochet.